Tua Tagovailoa. Kyler Murray. Dwayne Haskins. Laviska Shenault. Ed Oliver. Rashan Gary. These players have become household names across the college football landscape and deservedly so. However, since we at Pro Football Focus grade every player on every play of every game, we are best suited to inform you of those players excelling outside of the spotlight. Thus, as we give one final look at last week by outlining an interesting observation pulled from PFF’s wealth of college data, our Top 25 Observations series focuses this week on players from the PFF Top 25 who aren’t necessarily getting the attention, or snaps but are excelling at their respective positions. 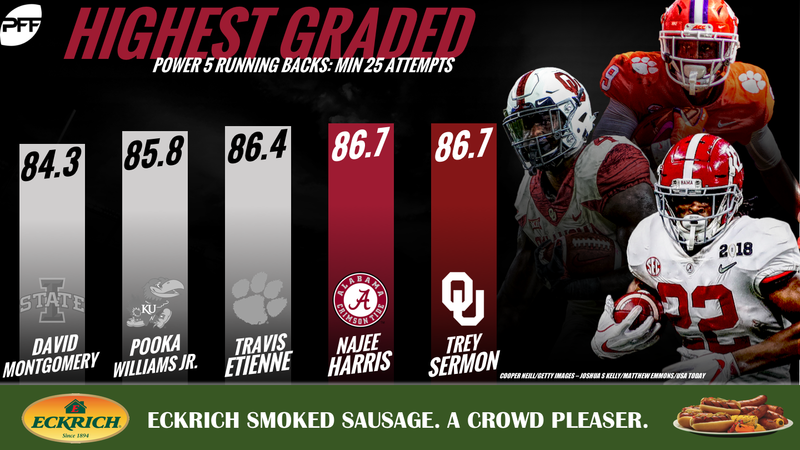 PFF’s Top 25 Observations series is brought to you by Eckrich, the Official Smoked Sausage of the College Football Playoff. While Tagovailoa and Alabama’s potent passing game has received most of the attention this season, Harris, the former top recruit, is leading a running game that has seen four different backs receive at least 44 carries. Despite just 69 attempts, he is tied for the fourth-highest overall grade at running back and is 30th in missed tackles forced (21). Expect his touches to increase as Alabama sees some tougher opponents in the future. It has been hard for TaRiq Bracy to see the field due to the depth of an extremely talented Notre Dame defense, but when the opportunities have come, he made the most of them. 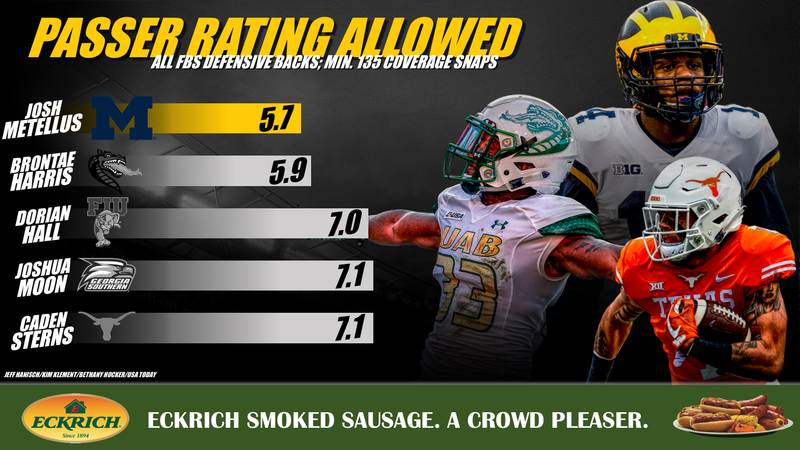 In only 46 snaps, Bracy has a 72.8 coverage grade, which is second on the team among cornerbacks and has allowed a 65.6 passer rating when targeted. He has yet to allow a touchdown on the season and is limiting opposing receivers to 0.91 yards per cover snap. Bracy is only a true freshman, so will see more time in the coming years and looks to be a good up-and-coming cover-corner for the Fighting Irish. Coverage in the secondary just became more important for the Buckeyes as they lost a valuable piece from their defensive line in Nick Bosa, who regularly pressured opposing quarterbacks and officially announced he won’t be coming back this season. Sheffield leads the Buckeyes in coverage grade (79.5) and has been difficult to throw against. Of the 20 targets into his coverage, he’s allowed only nine receptions for 129 yards and a 43.5 passer rating to go along with two interceptions and four pass breakups. Clemson has a reputation along that defensive line to keep, and Xavier Thomas is seemingly in line do just that once Christian Wilkins, Dexter Lawrence and Clelin Ferrell have left (likely for the NFL). In only 98 snaps, Thomas has accrued an 83.7 overall grade as his pass-rush has been his bread and butter. He only has 40 pass-rush snaps but has totaled 11 pressures, two sacks and owns a 90.3 pass-rush grade, which is the best on that vaunted defensive line. The best part about Thomas? As a true freshman, he is only getting started. When Rodney Anderson went down, the Sooners turned to Sermon. He has provided the tough running presence to go along with Heisman candidate QB Kyler Murray’s elusiveness and big-play ability. Sermon is tied for the fourth-highest grade with the aforementioned Harris and has forced 25 missed tackles on 68 touches. He has gained 67% of his yards after contact. While much of the attention on Georgia’s defense focuses on Midseason All-American Deandre Baker (91.3) or edge defender D’Andre Walker (83.7), Clark has been the Bulldogs most consistent interior presence. His is ninth among interior defensive linemen in grade and 23rd in run-stop percentage (11.1%, 10 stops). With Georgia facing Florida’s Jordan Scarlett (70.0) and Kentucky’s Benny Snell Jr. (76.2), two of the best runners in the SEC at forcing missed tackles after their bye week, they will need Clark to continue his elite play to help slow them down. Greedy Williams gets a lot of the hype and attention on the other side, but it is now Fulton making waves this season. Fulton is now the 21st-highest graded cornerback and has only allowed 32.3% of targets to be caught (10-of-31). Fulton is also coming off the highest-graded game (90.5) of his career, not allowing a catch on three targets into his coverage and also snagging an interception against Georgia. While coverage metrics aren’t typically the best to look at when discussing safety play, Metellus’ play in coverage is certainly deserving of highlighting here. He holds an absurd 5.7 passer rating allowed to opposing receivers, which leads all defensive backs with at least 135 snaps in coverage. He has not allowed a single touchdown this season to go with three interceptions and is allowing just 31.6% of passes thrown his way to be hauled in. In coverage from the slot, he’s allowed just a 13.8 passer rating and has two of his three picks. A three-year starter for the Knights, Johnson is having his best season yet and he, along with senior Wyatt Miller (68.5), are providing veteran leadership and time in the pocket for QB McKenzie Milton. Johnson has allowed only five total QB pressures as both he and Miller have yet to give up a sack. Taylor’s 21.2 passer rating allowed ranks 16th among all safeties with at least 135 coverage snaps played and he ranks tied for seventh with four pass breakups. Down the backstretch of the season, Taylor is coming off his best game of the year in a loss against Michigan State, where he registered an 84.4 coverage grade, didn’t allow a catch and had an interception and three pass breakups. Ferguson has been QB Alex Hornibrook’s most reliable target this season for the Badgers. He’s caught 72% of his targets (18-of-25) for 259 yards and a 115.3 passer rating when targeted. He is the sixth-highest graded tight end nationally, eighth in yards per route run (2.29), fourth among tight ends with five contested catches, and 16 of his 18 receptions have resulted in first downs or scores. After losing playmaker Josh Jackson to the NFL draft last year, Iowa needed someone to step up. Enter the true freshman in Brents who now leads the Hawkeyes with a 45.8 passer rating allowed, a 37.5% catch rate and a 79.8 coverage grade. He is second in the Big Ten with only 0.23 yards allowed per cover snap and is first in snaps per reception allowed at 34.3. What’s more absurd is that he has only allowed 24 yards on three receptions and has actually limited receivers to negative yardage after the catch. A three-year starter and four-year contributor, the redshirt senior Gaines has provided consistent and quality production for the Huskies. Overshadowed by 2018 first-round pick Vita Vea in the past, Gaines is the fourth-highest graded Husky defender and leads the team with 15 total QB pressures. In addition, his 17 defensive stops are second behind LB Ben Burr-Kirven (88.7) and ninth nationally among interior defensive linemen. 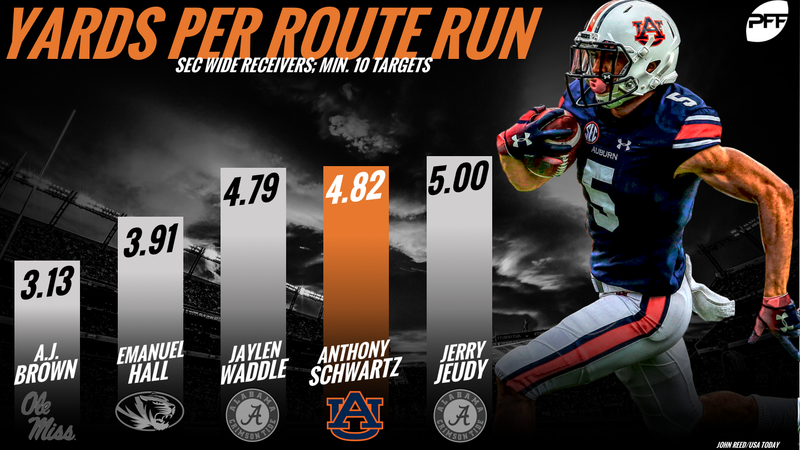 A heralded high school recruit, Schwartz is making an immediate impact at Auburn. He has only seen 15 targets but has caught 10 of them for 246 yards and two touchdowns. He is averaging 16.8 yards after the catch per reception, leading SEC receivers and has a 121.5 passer rating when targeted. Although only 6-foot, Schwartz is a dynamic playmaker and a brings world-class speed to the table. He will be a player to watch for the next couple of years as he takes on a bigger role for the Tigers. While Kevin Harmon is the Wolfpack’s most targeted receiver and the deep threat on the outside, Meyers dominates the slot. The converted quarterback has hauled in 30 of his 35 targets without a single drop, the third-most receptions without a drop in the FBS. In addition, his 2.98 yards per route run from the slot is 12th nationally, giving QB Ryan Finley (92.5) a go-to option when needed. Is Texas back? That is the question burning in folk’s minds in college football. As far as defense goes, yes Texas is seemingly back, and Boyd has had a heavy hand in that. Boyd ranks sixth among cornerbacks in the Big 12 with a 58.4 passer rating allowed and is limiting receivers to 0.65 yards per snap, which ranks tied for fifth among cornerbacks (min. 100 coverage snaps). His 80.2 coverage grade ranks third in the Big 12 and he has played the most snaps of any cornerback in the conference at 495. The senior and two-year starter at center for the Bulldogs is having the best season of his career. While his run-block grade has been average, Jenkins excels in pass-blocking. He only gave up eight total QB pressures (no sacks) last season and 2018 has been even better. He’s only yielded three QB hurries thus far and his 85.0 pass-block grade is 15th nationally among centers. 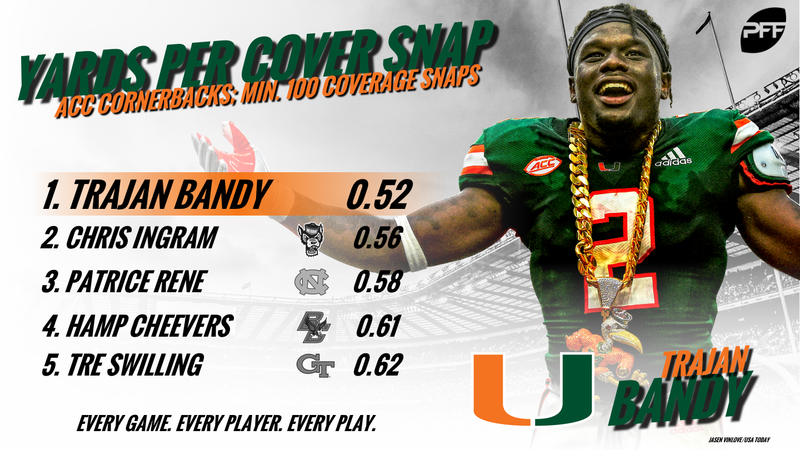 Although the season hasn’t gone like “The U” wanted, there have been some individual performances to celebrate and Bandy is one of them. His 88.2 coverage grade is second in the ACC and he is allowing a mere 0.52 yards per cover snap, which leads the ACC among cornerbacks. He has allowed two touchdowns but has snagged three interceptions to go along with a 60.1 passer rating allowed. He is coming off his best game of the season against Virginia where he snagged two interceptions and allowed a 2.8 passer rating in coverage. This trio is the core of what is our sixth-highest graded coverage team (94.1 team coverage grade). They have combined to allow only 49.4% of targets to be caught, just 200 yards after the catch on 43 receptions, six interceptions and 15 pass breakups. Bell is the 10th-highest graded safety, while Kelly and Hughes are the ninth and 23rd-graded cornerbacks, respectively. Part of Justin Herbert’s success has been the ability of his offensive line to keep him clean from pressure – where he currently holds the Pac-12’s highest passer rating. Throckmorton has been a huge part of that collective effort, especially his 89.9 pass-blocking grade, which ranks second the Pac 12. He has only allowed three pressures in 360 pass-blocking snaps, showing improvement in each season with the Ducks and is setting career-highs in overall grade, pass-blocking grade, pressures allowed and fewest penalties. A former Florida Gator, Cronkrite is getting better each week for the Bulls. He is now sixth nationally in rushing yards and his 4.83 yards after contact per attempt ranks 17th. He is also generating big plays, as his 60.1% breakaway percent is 15th in the nation. His nine explosive runs (15-plus yards) have yielded 458 yards, the third-most yards in the FBS. Swain leads all Florida wide receivers with a 76.4 receiving grade, 20.5 yards per reception, 9.0 yards after the catch per reception and a 139.3 passer rating when targeted. He is tied for the team lead with four touchdowns and is third in targets with 19. Swain has done the majority of his damage from the slot, running 96.3% of his routes inside and is averaging 2.80 yards per route run. He has yet to drop a catchable pass from the slot as well as he’s become a favorite target of QB Feleipe Franks. Hansen is used to dealing with change. After starting his Utah career as a quarterback, he eventually moved to the defensive secondary and the safety position. 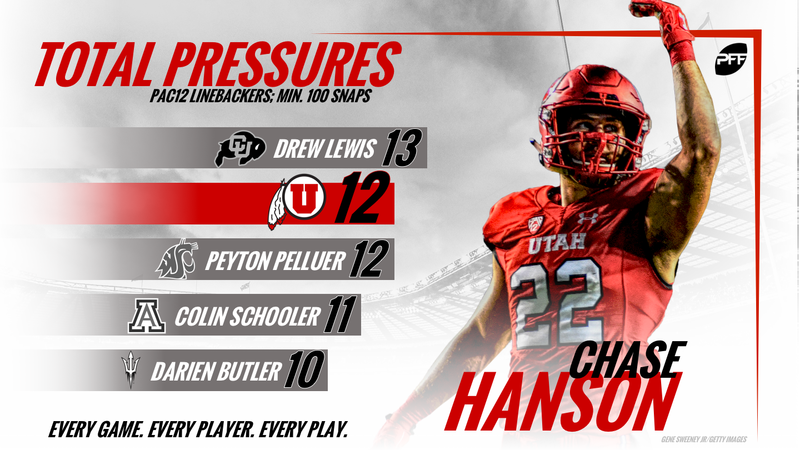 Now, this season as a senior, Hansen is thriving as a middle linebacker in the normally tough Utah defense. He is the 34th-highest graded linebacker while leading the Utes in stops with 28. In addition, he is fourth on the team with 12 total QB pressures, including four sacks. Making big play after big play is just what Franklin does. He checks in with a 79.5 overall grade, which puts him at fourth overall among safeties in the Sun Belt. He has yet to allow a single touchdown in 166 snaps in coverage. What’s even more impressive is his overall improvement in his time with the Mountaineers. Since 2016, he has improved in overall grade, coverage grade, catch rate allowed and passer rating allowed in each season. As College Gameday goes to the Pullman for the first time this weekend, a lot of talk will be centered on QB Gardner Minshew (88.9) and head coach Mike Leach’s spread passing attack. It’s Williams and his ability to catch the ball out of the backfield that is helping the Cougars’ attack yet again this season. Among running backs with at least 22 targets, Williams’ 90.8 receiving grade is No. 1 in the FBS. He’s caught 32-of-36 for 284 yards and three touchdowns. He’s averaging 10.2 yards after the catch per reception but this isn’t new for Williams, either. His receiving grades over the past two seasons have been 89.7 (2017) and 89.9 (2016).